Sovereign - 10' snooker table in Mahogany colour Sapele. Aramith snooker balls (or pool set). 3 x one piece quality ash snooker cues. 4 way wall / cue rack in matching woods. 10' foot table dust cover, table brush, chalk and triangle. * Produced from Sapele and hardwoods. * A delivery charge may apply if delivery is not in Malaga province. * The price includes accessories as listed above, any lighting bar or canopy that might be needed is not included in the price shown. Table fitting within 30 klms. of Malaga is included in the price shown. * Snooker table prices are calculated using an approximate exchange rate and the price shown may fluctuate, please call to confirm. 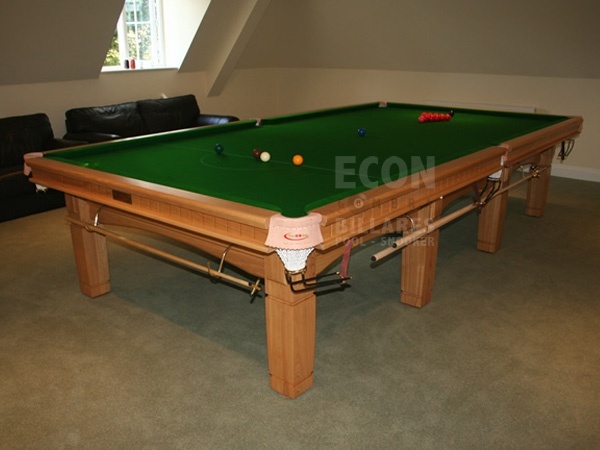 Sovereign - Full size (12') snooker table in Oak. 4 x one piece quality ash snooker cues. 12' foot table dust cover, table brush, chalk and triangle. * Produced from Oak and hardwoods. Sovereign - 9' snooker table in Mahogany colour Sapele. 9' foot table dust cover, table brush, chalk and triangle. The 'Executive' 10' snooker table is an elegant looking snooker table with a 9inch diameter tapered leg. This snooker table features carved cushion panels and side frames. Fitted with Hainsworth Match championship or Strachan 6811 club cloth and... best quality English Northern Rubber cushions. (Strachan 6811 can be supplied on request at no additional cost). This Snooker Tables can be made from a range of different timbers including Mahogany, Oak, Ash, Sapele, Maple and Cherry and can be customised to your requirements including colour matching. Cloth for snooker tables is available in all colours and types. The Executive 9' snooker table is an elegant looking snooker table with a 9inch diameter tapered leg. Can be fitted with Hainsworth Match championship or Strachan 6811 club cloth... and best quality English Northern Rubber cushions. (Strachan 6811 can be supplied on request at no additional cost). 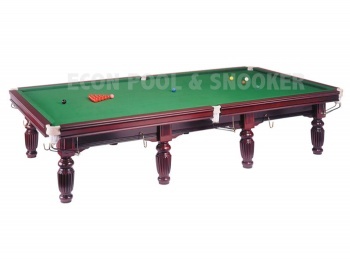 Contrary to most other table manufacturers, the marker board and cue rack for this table are all manufactured and colour matched to complete this very professional and quality table package. All parts are made from solid hardwoods for durability and accuracy. 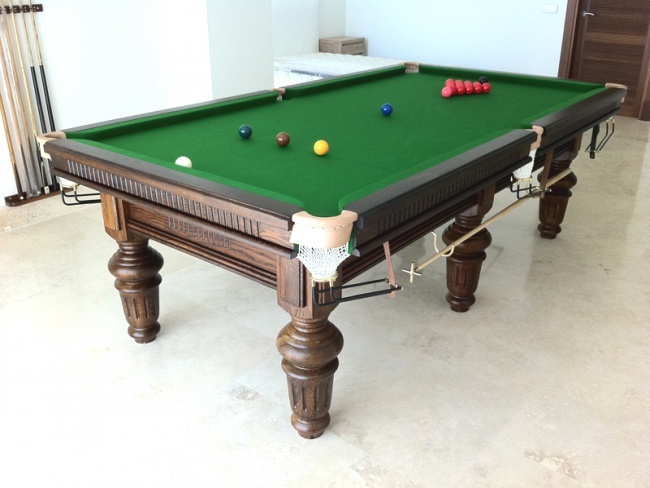 This Snooker Tables can be made from a range of different timbers including Mahogany, Oak, Ash, Maple, Sapele and Cherry and can be customised to your requirements including colour matching. Cloth for snooker tables is available in all colours and types. 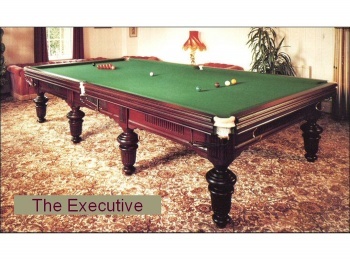 The 'Executive' full size snooker table is an elegant looking snooker table with a 9inch diameter tapered leg. Fitted with Hainsworth Match championship or Strachan 6811 club cloth... and best quality English Northern Rubber cushions. (Strachan 6811 can be supplied on request at no additional cost). The Executive 8' snooker table is an elegant looking snooker table with a 9inch diameter tapered leg. The Century - Full size snooker table in Oak. 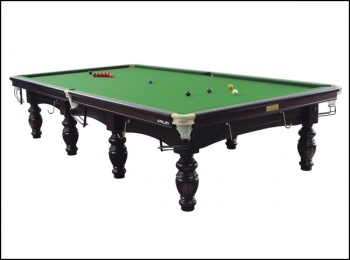 Manufactured in England - Snooker tables of outstanding quality and finish. 4 x one piece 58 inch rosewood and ash cues. * Diamond bench precision ground slate bed playing surface. * High performance competition standard match-play rubber assembly fitted to all six cushions rails. * Solid brass pocket plates and broad bow pocket leathers, pocket nets and pocket rails. * All table wood is hand polished and finished. * Steel block cushions can be supplied as extra (+500 Euros). Only the best quality kiln dried hardwoods are used in the construction of our range of solid hardwood snooker tables. All table wood is hand polished leaving a finished product of unparalleled elegance and refined looks. * The price includes accessories as listed above, any lighting bar or canopy that might be needed is not included in the price shown. The Classic - Full size snooker table in Oak. 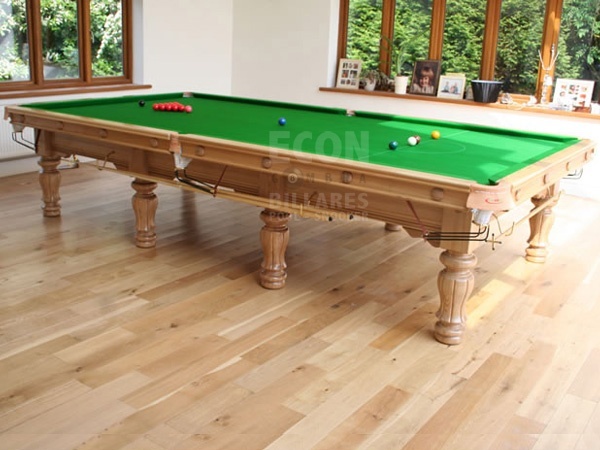 Only the best quality kiln dried hardwoods are used in the construction of solid hardwood snooker tables. All table wood is hand polished leaving a finished product of unparalleled elegance and refined looks. 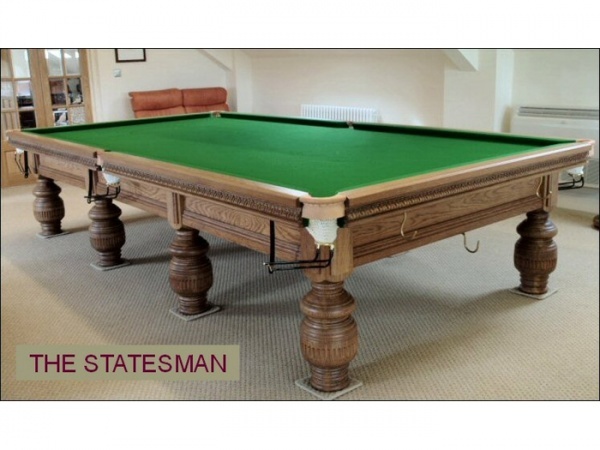 The Majestic - Full size snooker table in Oak. 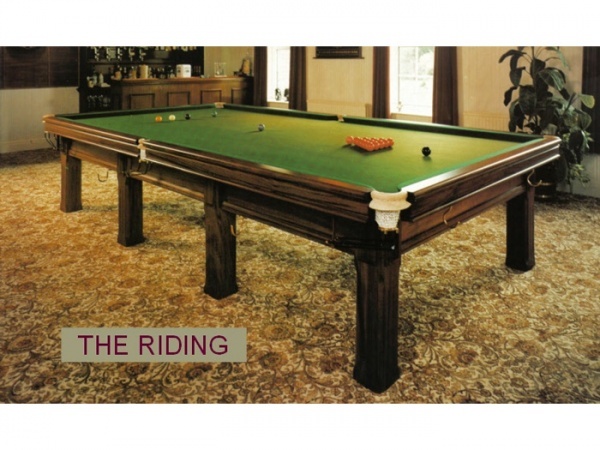 The Regal - Full size snooker table in Oak. 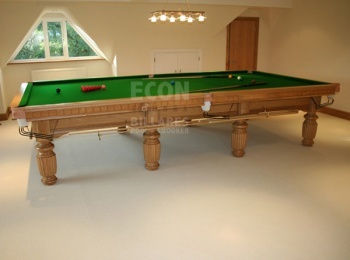 The Traditional - Full size snooker table in Oak. Only the best quality kiln dried hardwoods are used in the construction of fcsnooker's range of solid hardwood snooker tables. All table wood is hand polished leaving a finished product of unparalleled elegance and refined looks. The Elegance - Full size snooker table in Oak. 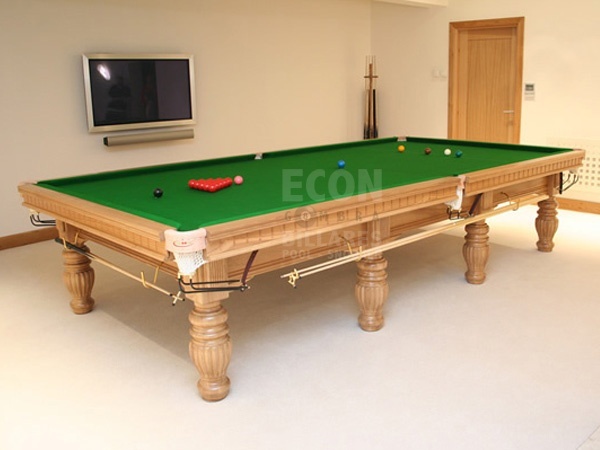 The Elite - Full size snooker table in Oak. Aramith 2 and 1/16 inch snooker balls. 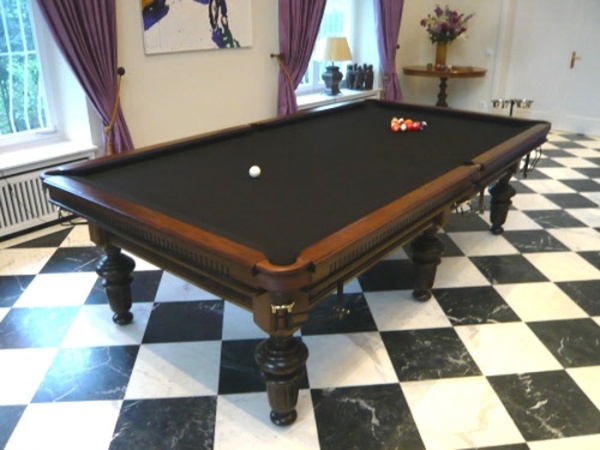 The Aristocrat - Full size snooker table in Mahogany. 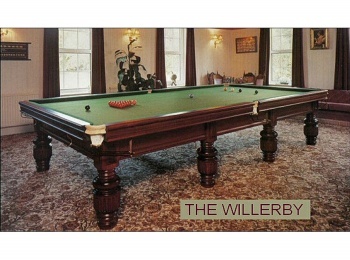 Manufactured in England - Riley Snooker tables of outstanding quality. Two player marker board in matching woods. * Pocket leathers selected from the best quality hides, blemish free. * Stratchen cloth as standard. * High quality northern rubber. * Aristocrat cushions cut to tournament specifications. * Italian 5 peice slate, precision honed by laser creating the optimum playing surface.. 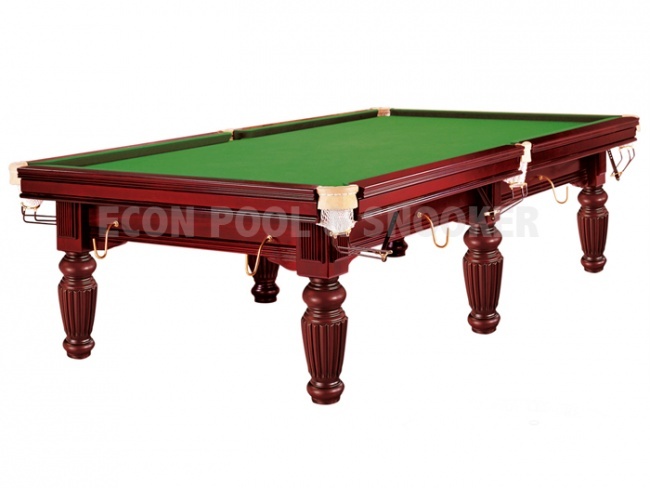 The Aristocrat tournament champ - Full size snooker table in Mahogany. * Riley Galvanised steels for optimum response along the entire length of the cushion. * High quality Northern rubber as selected for all professional and amateur tournaments throughout the world. The Aristocrat with steel block cushions - Full size snooker table in Mahogany. The Renaissance - Full size snooker table in Mahogany. 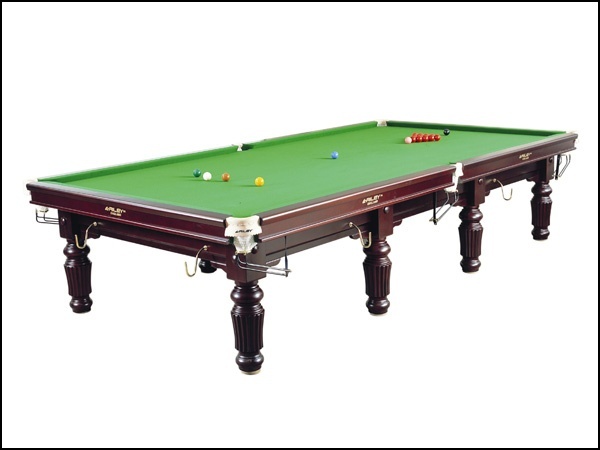 Riley Snooker tables of outstanding quality. Championship Aramith 2 & 1/16 inch snooker balls. * Produced from carefully selected mahoganies and hardwoods. * Professional quality cushion rubber. * Genuine high quality durable pocket leathers. * 1 and 3/4 five peice precision ground slate. 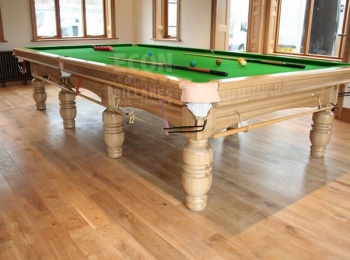 The Riding full size Bespoke Oak snooker table. 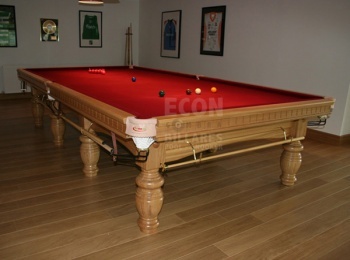 A clubroom snooker table with a 5.5inch square leg. Fitted with Hainsworth Match championship or Stratchen 6811 club cloth and best quality English Northern Rubber cushions. (Strachan 6811 can be... supplied on request at no additional cost). This Snooker Tables can be made from a range of different timbers including Mahogany, Oak, Ash, Maple and Cherry and can be customised to your requirements including colour matching. This 10' Oak snooker table would grace the most elegant snooker room. A solid looking appearance, enhanced by the 9.5inch diameter legs and the carved moldings on the cushion panel. Contrary to most other table manufacturers, the marker board and... cue rack for this table are all manufactured and colour matched to complete this very professional and quality table package. Fitted with Hainsworth Match championship cloth and best quality English Northern Rubber cushions. (Strachan 6811 can be supplied on request at no additional cost). This image is of a 12' table but the 10' version also comes with 8 legs. 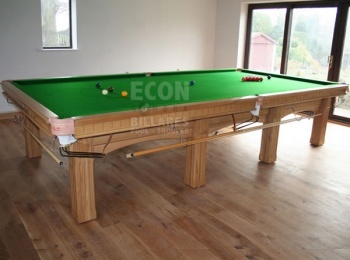 This full size Oak snooker table would grace the most elegant snooker room. Contrary to most other table manufacturers, the marker... board and cue rack for this table are all manufactured and colour matched to complete this very professional and quality table package. This Willerby 10' Oak snooker table would grace the most elegant snooker room. A snooker table made for the clubroom with 8inch diameter legs. This snooker table has the same high playing qualities but without the decorative features. Fitted with... Hainsworth Match championship or Strachan 6811 club cloth and best quality English Northern Rubber cushions. (Strachan 6811 can be supplied on request at no additional cost). 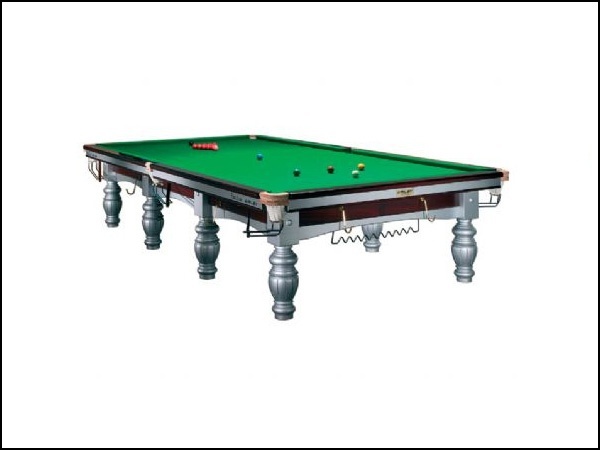 This Snooker Tables can be made from a range of different timbers including Mahogany, Oak, Ash, Maple, Saple and Cherry and can be customised to your requirements including colour matching.